Alcea setosa (Bristly Hollyhock) is prominent in its height and beauty in the spring, due to its impressively colored and large flowers which are arranged along an inflorescence stalk which is visible from afar. The leaves are carried on a long petiole. The blade is emarginate with a diameter of 15-20 cm. The leaf margin is smooth or dentate. As spring nears, a tall inflorescence stalk grows, which can reach a height of 2-3 m. The stalk is lignified, with alternate sessile leaves along it, with flowers in their axil. The leaves, the inflorescence stalk and the fruits are characterized by bristly hairs on their surfaces. 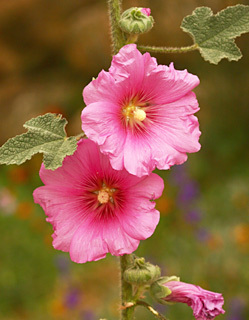 The bisexual flowers of Bristly Hollyhock are single and large, with a diameter of approximately 10 cm. The external involucre, which envelopes the sepals, is a calycle. This is a green and fused involucre with 6-9 lobes. The length of the involucre is almost identical to that of the calyx. There are 5 sepals and 5 petals. The corolla is pink, purple-violet and emarginate at its head. Sometimes the base of the corolla has a different color than the rest of the petal. There are numerous stamens and they are fused into a prominent yellow tube in the center of the flower. The stamen filaments are fused almost to the anthers. The pollen is sticky. Insects, especially bees, visit the flower and clumps of sticky pollen adhere to them. These will be passed, via the insect’s body, to another flower, and fertilization will take place. The ovary is composed of numerous carpels. Each ovary contains two loculi, and each loculus contains one seed. The fruit is a schizocarp, i.e. a fruit that degrades into several seed-containing units. The schizocarp is round, with a flat base and is enveloped by the sepals and the calycle. Upon ripening it changes its color to brown and rigid bristly hairs are prominent on its surface. In the summer, the schizocarp degrades and the seeds are dispersed. When rain falls, the seeds germinate and new plants will decorate the landscape. Bristly Hollyhock has in recent years been sown alongside landscaped roads. Many varieties are known in gardening, with dark red to blue flowers. The plant is common in most regions of Israel, in the Mediterranean area, on mountains, abandoned fields and in bathas.